A great deal is known about how infants form attachments, and how these processes carry over into adolescence. But after that, the trail grows cold: the study of adult attachment emphasizes individual variations, paying little attention to the normative mechanisms of adult bonding. The distress-relief dynamic in attachment bonding.An expectancy-value approach to attachment.The biobehavioral legacy of early attachment relationships for adult emotional and interpersonal functioning.How early experiences shape attraction, partner preferences, and attachment dynamics.How mental representations change as attachments form.Insights into the formation of attachment bonds from a social network perspective. 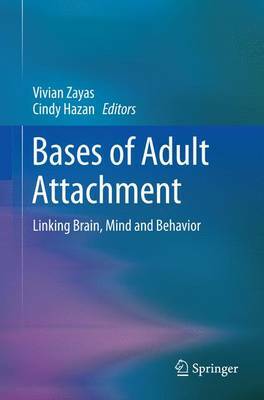 Bases of Adult Attachment will interest scholars approaching adult attachment at multiple levels of analysis (neural, physiological, affective, cognitive and behavioral) and from multiple perspectives. This wide audience includes developmental, social and cognitive psychologists as well as neuroscientists, neuropsychologists, clinicians, sociologists, family researchers and professionals in public health and medicine.